Well, after that long kayak trip, I ended up sick and resting all week. I thought I would put up a teaser of my secret project. 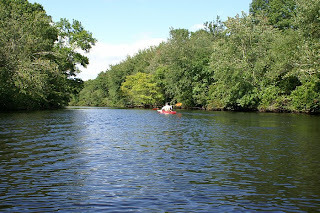 Today, I decided it was a good day for a river paddle, so we paddled a section of the Pawcatuck river in Bradford, Rhode Island. I say a section, but it was 3 miles one way and we had to come back too. This is a nice launch, sandy and open with lots of parking, so it is a good place to start. It is a long windy river. 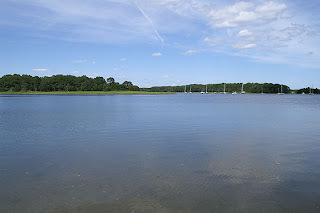 The river itself runs from Wardens Pond out to the sea. 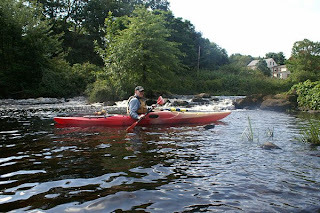 It is a long and windy river, but a beautiful place to paddle with long stretches of untouched wilderness. Our favorite place to stop is a wilderness camp owned by the state park system. You can camp here, but we find it a great place to rest and cool down in the cold waters. Our destination was the rapids which was once the site of an old mill. It was a long paddle for me and we still had to turn around and head back. 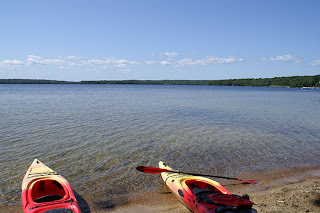 It was a tough paddle for me, but it was fun and nice to get out on another beautiful day. I decided I needed to stay home today and get some things done. 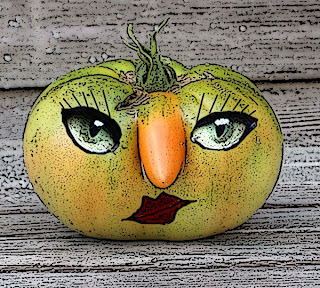 One of the things I have neglected is the garden. I had a bunch of cucumbers and tomatoes, so I made pickled cucumbers and stewed tomatoes. 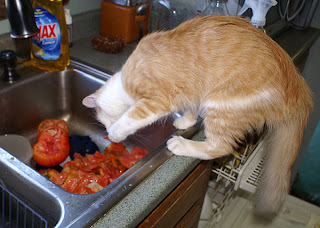 Of course I could not do it without my trusty helper who has to have her paws into everything. 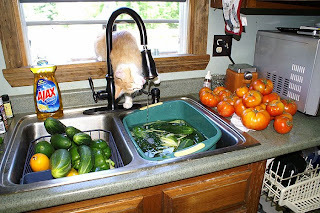 And no, I do not use hairy veggies, they are washed and prepared on the no kitty counters;) As you can see, Dora has to be in the midst of things and her personality has me laughing every day. Suffice to say, I was able to finish things with no disasters and we had a wonderful pot of american chop suey for dinner. 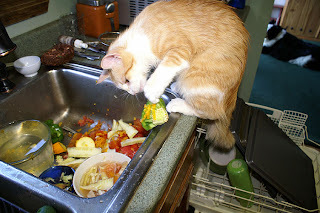 "This yellow thing looks interesting, I wonder if it is any good. Hey Casey, want to try a bite?" 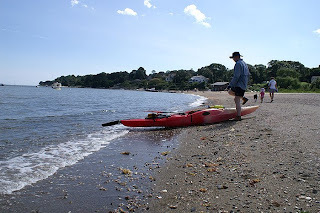 "Now this is not my cup of tea, ick"
Yesterday we went paddling at Burlingame state park. 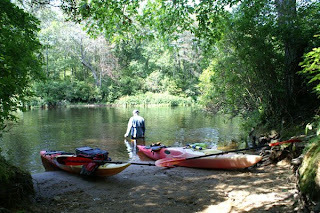 It is a beautiful place to paddle, half of it is owned by the state, so there are a lot of quiet areas. It is also shallow in a lot of areas, so we can keep away from the larger boats and get out and swim in several areas along the way. This is where we started from, a nice parking area with a sandy launch. 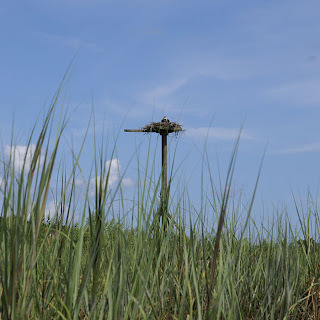 One of our favorite places to stop is on the opposite banks of the main campground. It owned by the camp, but no longer used for camping since they are too lazy and cheap to pay someone to keep an eye on that side. It makes a great stop for a picnic and a swim and no crowds, and usually no people at all, so we have the beach all to ourselves. As you can see, Bill, the speck in the water, has to go far out to get deep enough for a swim. 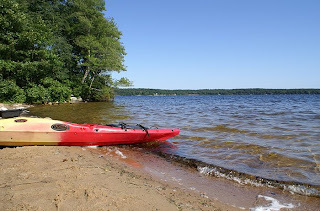 The water is extremely warm and I felt like staying on the beach all day, but we had to get back to our paddle. We had such a great time, that we decided to go back today and paddle in the opposite direction. The weather has been gorgeous this week and we wanted to take advantage of it while we can. We also like to go here when it is not crowded, so the weekdays are perfect. We got a treat today as were were paddling along the area where the beach is. 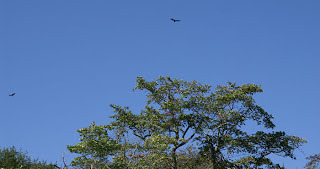 About 10 hawks were riding on the updrafts that come in from the ocean winds. They were soaring and rising into the sky, going higher and higher till it seemed like they disappeared. It was a sight you cannot capture on still cameras and the water was choppy, so I had to use a regular lens. It was a beautiful site for a perfect day. To top my day off, I received a wonderful prize for Pat Sloan. She had a contest for cupcakes and we had to find a cupcake site to enter. It was fun to do and it is amazing how many cupcake sites there are on the web. I love the cute pattern and beautiful fabric. Will have to make something special with them. 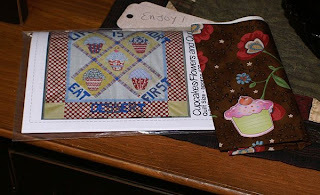 Check out Pat's site on the web, she has lots of fun patterns and a wonderful blog. Dora has character or is a character, or a bit of both, lol. She seems to be interested in everything I do, including the shower. 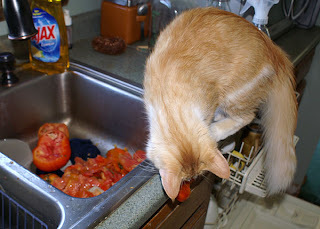 She helps me with the cloths, loves to help when the printer is running and today she helped me peel tomatoes. 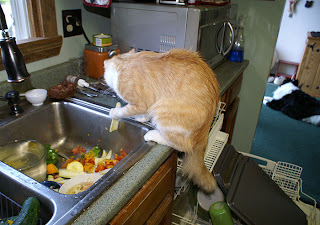 "Hey why are you throwing these away, they look good to me." "Hate to eat and run." 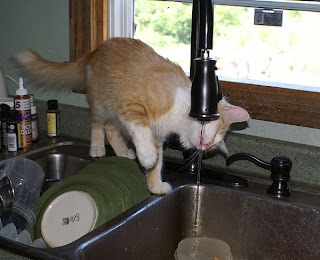 "All this work has made me thirsty." A long day of mischief for Dora and she goes into her Coma sleep. "Do not disturb!" 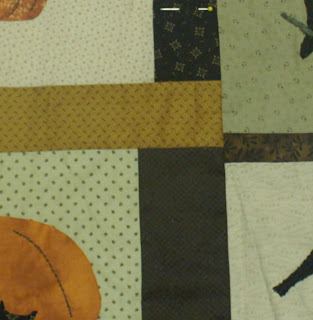 There are full patterns for Halloween, fall and even a primitive turkey. 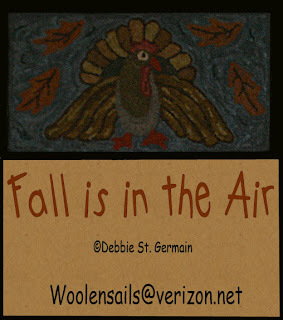 You can use the patterns for rug hooking or punch needle. You can also make the items to sell on ebay or at fairs, as long as credit is given for the designs. I am offering two booklets for 20.00, a savings of 4.00 if bought separately. 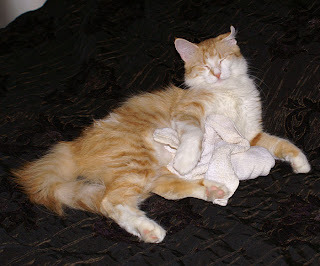 All of the proceeds from the booklets will go towards the vet bill for my new Kitty Dora. She was checked and had all her shots, but it seems to me she is not thriving, so I want to have her checked out throughly. Last month my dog had to do the vet thing, he still has lyme, so he is on treatments and doing better. Thank you for your patronage of my patterns and goods this past year. If you would like to take advantage of this special, email me directly and I will send you a paypal bill for the items. 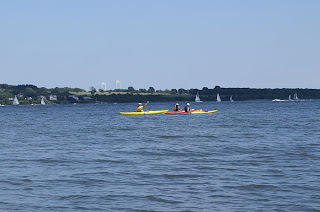 Yesterday we went for a paddle on Narragansett Bay. 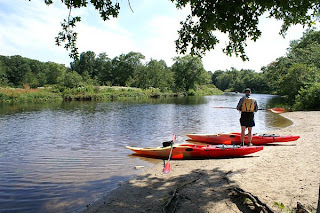 It is such a perfect spot to paddle, close to home and gorgeous views. I actually went further this time, so my strength is better, but by the time we got back, I was dragging. Today we planned on going to a local lake, but the clutz that I am, whammed my elbow into the door frame, so I had to take the day off. 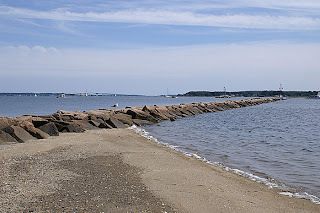 This beach is near the bridge that goes to Jamestown and the bridge that you see in the distance takes you to Newport. When I was younger we spent time at this beach and the clubhouse since I lived down the road. Sometimes it is nice to stay close to home and enjoy the things that we take for granted. I finished the pillow and sewing for the punched piece I made earlier this week and like how it came out. I used wool for under the punched piece, then sewed that onto a piece of cotton ticking. I love the real ticking for pillows. I can sew a tight edge and then fray the outer edges and it gives it a great look. 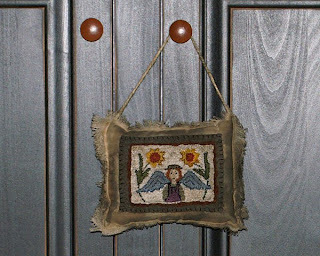 On the back I hand stitched Angel Blessings and an old date along with my initials. 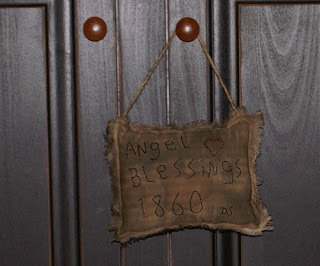 I hope you enjoy my newest creation and if you would like to own it, you can see it on my ebay site. I have been busy again with new pieces for ebay. 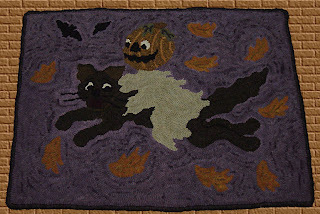 This piece is from my halloween booklet that can be found at my ecrater site. 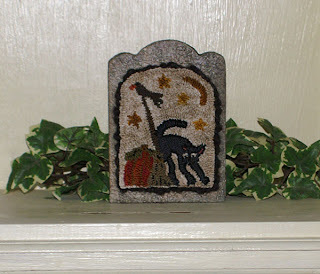 I have never done this one and thought it would be fun to do in a punched piece for a gravesteone. This one is thicker and stands on it's own, so it would be fun with a halloween arrangement. I love making pieces for Halloween, it opens itself up to so many fun and whimsical pieces. 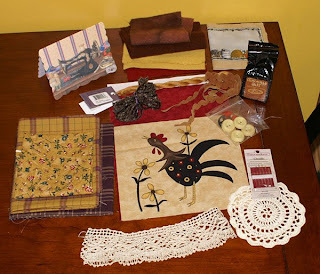 I belong to a great primitive quilting group and this summer we had a quilt challenge. We had to send a partner, 3 fat quarters and any embellishments we wanted. This is what I was sent to work with. I have been working on and off all summer and had no idea what I was doing, just added as I went and this is what I came up with. 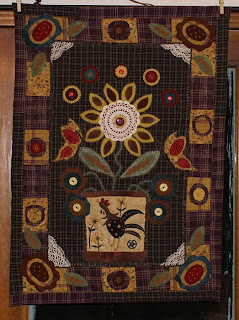 I will add some tabs to the top to hang it with, maybe on the kitchen window or it might be a present for someone who loves chickens and roosters;) It is hard to see on the quilt, but there is a lot of stitching with the thread she gave me, all hand done. It was a gorgeous day today, warm with a nice breeze. We have had days of rain and more to come, so it was nice to get out while we had a chance. My husband and I both needed a fun day to relax and enjoy ourselves. This was our launch site, the harbor in Wickford which is just down the road from me. The first thing we paddle around is a small island. I think they call it rabbit island now, but it was once Queens Island, where the indians lived in the summer. 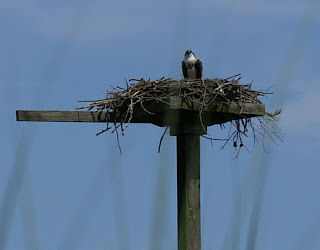 I was treated with a view of the falcon nesting on her high perch. I love to stop and enjoy the views and we made this our first stop, the breakers where the boats come in and out of the harbor. Our last stop was the town beach. We are fortunate to have a beautiful beach for the town residents. 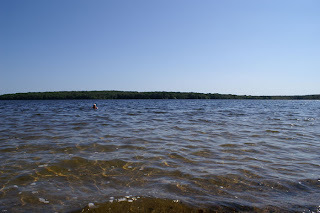 It is a great place to stop and take a swim and just enjoy the day. It was a nice afternoon and we took our time and just had some relax time for the both of us. This is what happens when you have too much time on your hands, haha. My husband is working on our floors today, so he is tearing the house apart and banging incessantly. I spent as much time as I could outside to get away from it and worked a bit in the garden. 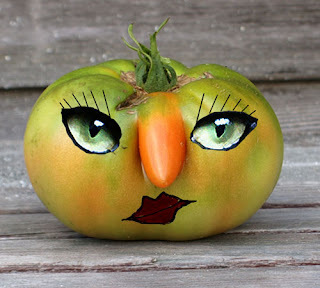 This is what I found in the garden today, yes, I am warped as usual. I had to play with filters and made an artistic version. Now back to real creating, he is finally finished and I can sit and relax and work on my new projects. You can find this piece and my gravestone angel on ebay. It amazes me that Dora stayed alive long enough to make it to a shelter. She is into everything and I mean everything. The minute I open the refrigerator door, she zips by me and jumps in. Here she is with that stubborn look, and she is stubborn. I convinced her that she would freeze to death or suffocate if she didn't get out, so I guess that convinced her and she left finally. Now I watch as I open the door, but she still sneaks up on me and gets in. After that she followed me to the laundry room and kept jumping in the washing machine and I had to keep taking her out. I am very very careful about opening and closing things with her around and always double check. I finished a new punch needle today, another mermaid in my series. This one is a traditional style mermaid with my own style and borders. I have a new booklet out with the mermaids that I have done, if you would like to make your own. 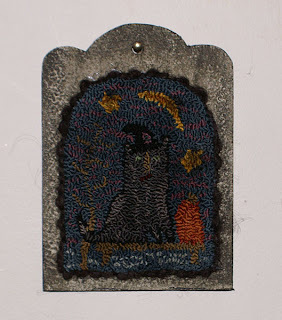 The piece is placed on one of my own hornbooks that was painted with a black over gold and then antiqued. The whale's tail design works so nicely with the mermaids. This piece will be available tonight on ebay if you are interested in purchasing this newest piece. It was a gorgeous day out, a few clouds, a light breeze and the salt water, what more can anyone ask for. This was where we stopped to take a break, more sand here than the other areas. There were also hundreds of starfish that had washed up as the tide went out, but it was just starting to come in and took the starfish back to their watery homes before they dried out. We went as far as the bridge, where the old lighthouse still sits in it's place of honor. They tried to get rid of it, but luckily it was saved and repainted. Sometimes it is fun to stay close to home and enjoy the beauty in our own areas.